Open fire grill restaurant where everything is cooked over alder and oak wood. Influenced by the dining cultures of Scandinavia with a great British produce. Open for lunch, dinner and late night drinks. The menu is made up of mainly smoked meat and fish dishes with a focus on fermention such as: cures, pickles and jams. Also great smoked vegetable dishes finished on a custom built wood fuelled BBQ. Great cocktails and they specialise in brewing their own alcohol such as sparkling wines, ciders and meads. Late night booking are encouraged during the summer so much that you'll likely be offered a free shot of Aquavit. Late bookings on the weekend will be able to keep there table until 1am as the restaurant switches into a cocktail and oyster bar and also serving their housed brewed ciders, wines and meads. Lunches offers a lighter menu consisting of shellfish, smoked meats, cold salads, open sandwiches and coffees. A menu of smoked meat, cures, pickles and vegetable dishes. Award-winning Islington charcuterie Cobble Lane Cured supplies the restaurant, resulting in the likes of smoked short rib of beef with birch syrup or duck leg with bacon and lingonberry jam. Salads of charred broccoli with pumpkin seeds and toasted almonds, or beetroot with goats’ cheese and hazelnuts, Jars of fermented vegetables, the menu takes heed of seasons, with a regularly changing menu. If you’re just after a light bite, there are plenty of snacks on the bar menu, served after 10pm at the weekend. The restaurant was closed for business. Not sure why it was accepting any reservations. Showed up for a table booking I made about a month ago to find the doors shut and the lights off. Checked their website and social media feeds, nothing of note there. Searched for the restaurant name on Twitter to find they've closed. Poor form not to have followed up on bookings to let customers know. I arrived at the restaurant for my booking on Fri 28 September at 20.30 only to find the restaurant was closed and that was after receiving the reminder of my booking. Very disappointed for what has been such a lovely place that I've been to recently. The restaurant was closed even though the reservation was confirmed via OpenTable. Absolutely delicious food. We were recommended the pork and the duck (which we got) and they were outstanding. We had a fabulous meal. Kind staff and we will definitely be back. Only criticism is the music was far too loud for such a small space and it made it really difficult to have comfortable conversation. Excellent food at a very reasonable price for the quality. Had a fantastic evening's dining at Rok. We travelled up from Brighton to stay in Shoreditch for our 10th Wedding Anniversary. 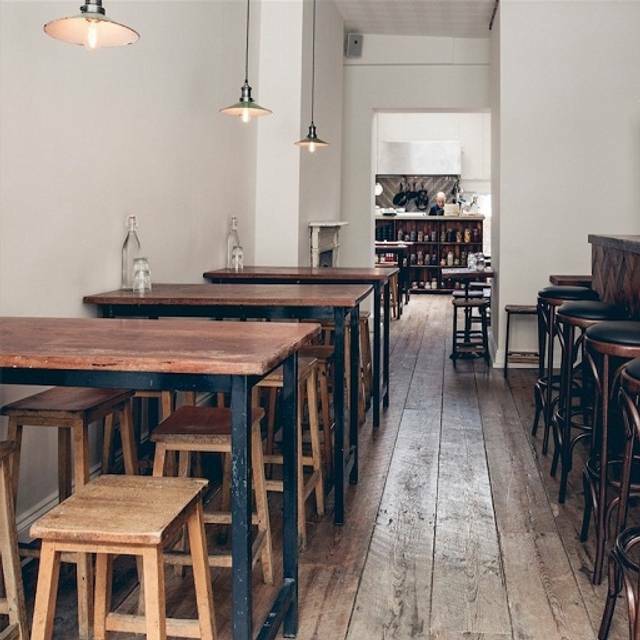 ROK perfectly reflects the cool, on-it and welcoming vibe of Shoreditch. The food was superb (the Quail scotch-eggs were to-die-for). Couldn't have asked for a better setting to celebrate our 10th Anniversary. 100% we'll be back again. Laid back vibe I love with tasty small dishes. Loved the cucumber and broccoli. Excellent, consistently interesting, and tasty food, reasonably priced. It's the kind of place where you go with a group of 4 people and order the whole menu. My only complaint is that the wines were just OK. I would definitely return. Enjoyable Monday night meet up with a friend. We were looking for something a bit different & found it! The menu is quite small - four starters, four mains, four sides & two desserts to choose from - but interesting (Nduja scotch quail egg, guinea fowl pate, wood pigeon breast...) & done very well. It's not the cheapest, but is good value for the quality. We liked the cosy, low key surroundings & attentive but not intrusive service. Great food! Friendly service, amazing chef who cooks everything on his own! Thank you! We truly enjoyed every food we ordered. This is the third time I've been to Rok Shoreditch. The food is always delicious; no doubt I'll go again! Amazing place and food, definitely recommend. A must go to! We had an amazing time at the Rok Shireditch. 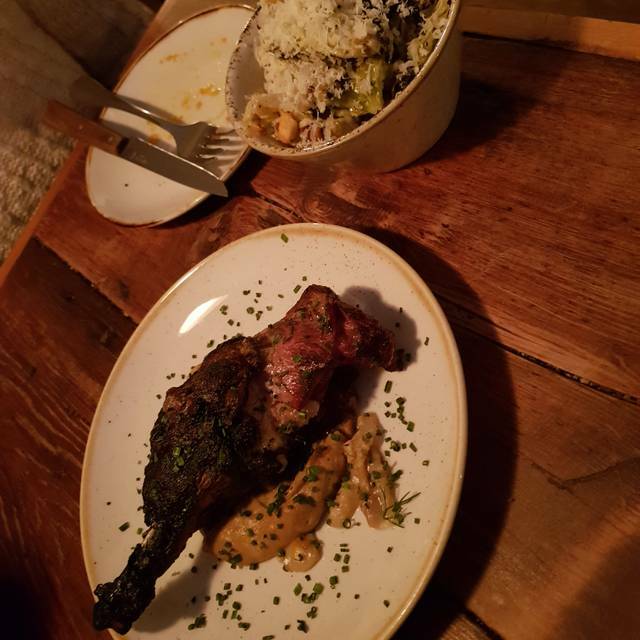 The food was both exceptional and authentic and the service was fantastic. Excellent food and service just the portion sizes in relation to the cost were not great. Otherwise me and my fiancé had a great experience. I have been a frequent diner at ROK since it opened. I am very pleased it has established itself because with the plethora of restaurants invading this area, it is one of the very few I would recommend or patronise. I t has maintained its high quality of cookery and service and interesting offerings through out its 3 year existence . Not many restaurants can make that claim. I am a former restaurateur. Meal was delicious. Everyone going definitely order all the sides! Especially the cabbage with macadamia nuts. It was the best! Amazing food and amazing place, great service and just loved everything about this place! Will definitely be back! 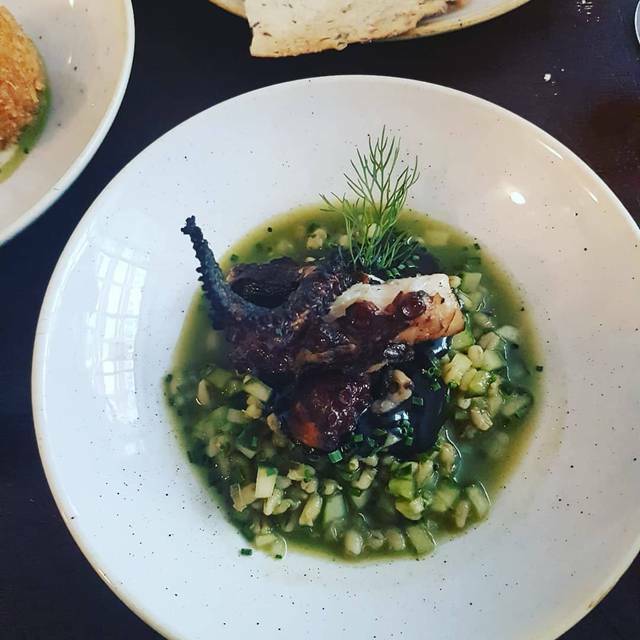 The octopus especially was out of this world!! Can not recommend this place enough! Great food. Specifically recommend the blackened cabbage as a must have side. Great quality ingredients and nice ambient. This is a really great little restaurant. If you like Scandi food then it is a must to visit, the flavours and presentation were fantastic. I wanted to eat my meal again (and not for hunger, through flavour experience). Imaginative food with incredible vegetable sides. Solid wines. Friendly service. Would be nice to have cushions on the hard benches. Great food! Excellent, knowledgeable and friendly staff, highly recommended! Just average all around. So-So service. Certain dishes were solid, others were hard to chew. Whilst reviews were good. The place was unfortunately quite smelly “damp” smell. Our table was stuck by corner and didn’t feel it was right place for a special occasion. On positive the food was unique. Liked the side brócoli. Menu was quite limiting and made things a bit difficult for fussy eaters. Sorry but that was our impression. Thus was my second visit on one week. A friend had arranged dinner one night and I loved it so much I had to take a few more friends back a few days later. All of the starters are fantastic. Highly highly recommend the scotch egg. Even if you’re not a fan you’ll love it here. For mains we ordered the four and shared. All delicious. Small but great wine selection to accompany the delicious food. Looking forward to going back again. I took my friend here for a birthday meal; the atmosphere was OK, the restaurant was pretty quiet but that was good as we were seated near the toilets so if it were busy, we would have had people passing all the time. As it was, we had very good service,e the staff were very pleasant and friendly. We tried the scotch egg - which was amazing - the pate and the celeriac were OK but nothing special, and the mutton chops were so fatty I couldn't eat them. There is a pretty limited choice of dessert. 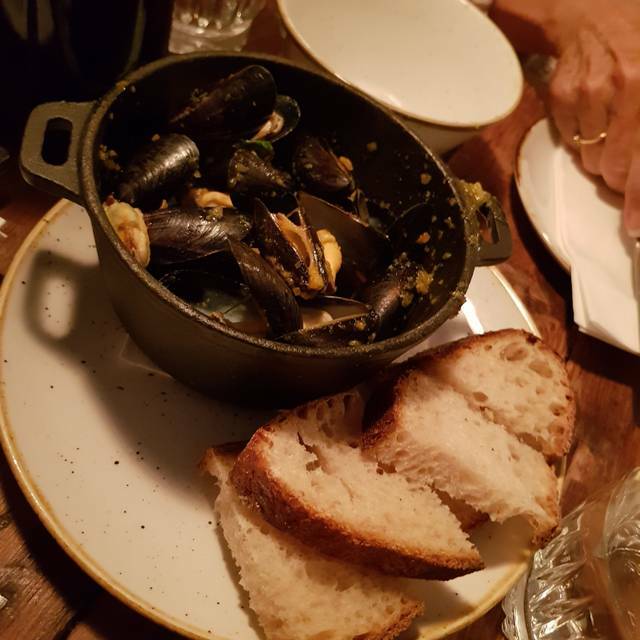 I wouldn't come back myself as the food is not to my taste and it is pricey - a bottle of pouilly fume is £59 and our bill for wine, 3 starters, 2 mains and 1 dessert was over £150. Fresh simple food with a lovely atmosphere. We enjoyed our 3rd wedding anniversary at rok-it was recommended to us by a chef friend of ours. And it did not disappoint! From the smiley staff,delicious cocktails and well matched beers, to the melt in your mouth Octopus and the richly flavoured fish croquette. An unforgettable meal, perfectly ended with an unctuous laphroiag honey peach. Sublime. As always great food and service- menu changes all the time which I think is a good thing. 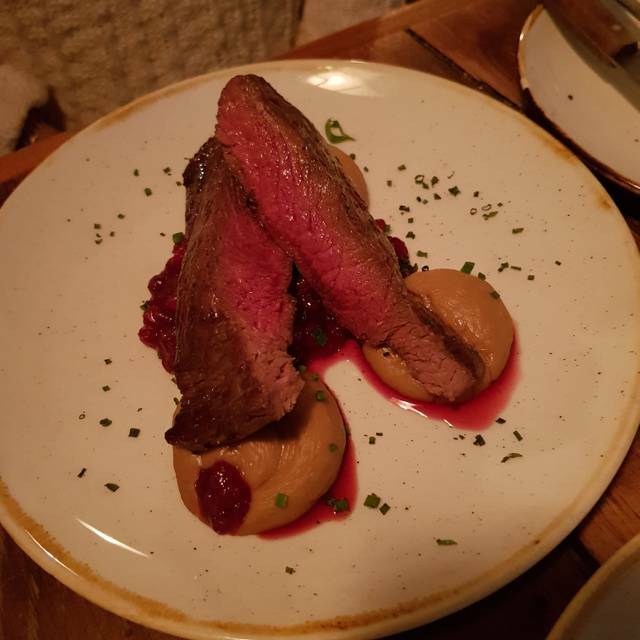 The service was good and the food looked the part but we both found it somewhat bland which combined with the small portions and disproportionate price tag leads me to think Rok is more form over substance. 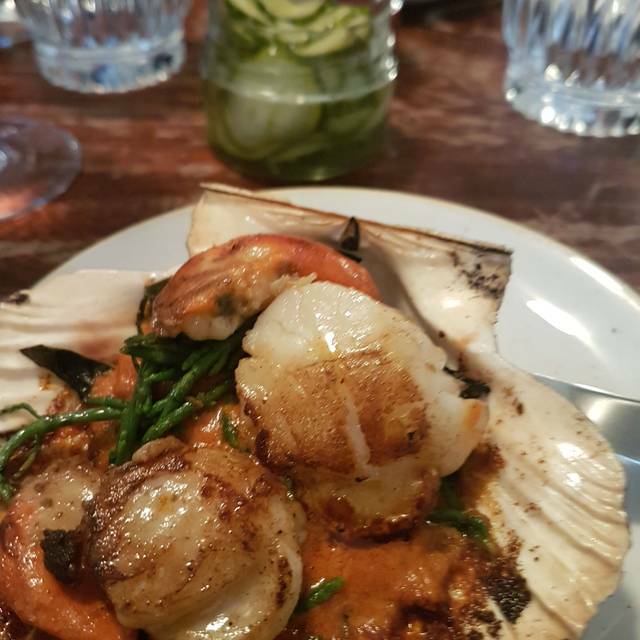 Scallops were lovely, as were the side dishes. Pork was great for me, tough for my better half. A tad dear but an interesting experience. Impromptu visit as we were in the vicinity. Great food - especially the broccoli. 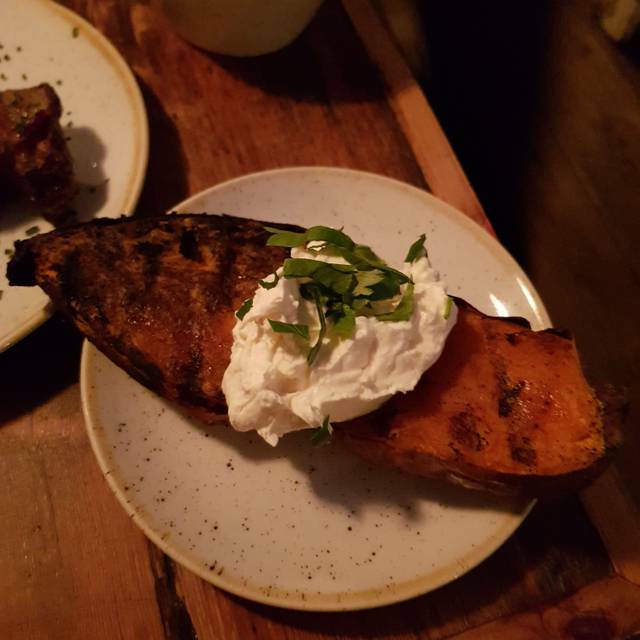 We loved Rok Shoreditch for the most delicious food. Since there were 4 of us we tried everything on the menu. The wines we had were interesting and complimented the food. Do not be put off by the simple exterior and wooden tables and chairs - you will miss out if ypu are.